PowerLix has taken the time to develop a specialized fabric blend with 4 way stretch capability, offering all around superior protection and support above and beyond what you've experienced before! The breathable fabric, absorbs sweat quickly and keeps your feet dry and odor free, allowing you hours of continuous use! ✔ 4-way compression sleeve ergonomically designed for full range of motion and full protection. ✔ Significant pain relief from a variety of ailments including plantar fasciitis, arthritis, sprains, swelling, tendonitis, muscle fatigue, and other Knee pain. We're so sure you'll love the PowerLix Knee Brace that we offer a 100% Money Back Guarantee for 6 months. If for ANY REASON you don't like it, we'll refund every penny with no hassle. 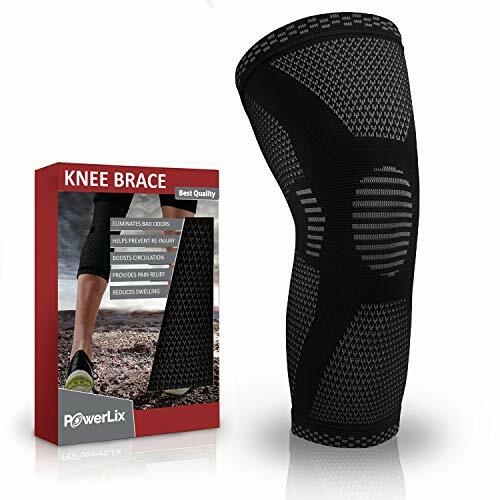 PHENOMENAL PROTECTION: PowerLix Knee brace apply stable pressure across your knee joint, which provides ultimate pain relief from a variety of ailments including arthritis, swelling, tendonitis, meniscus tear, soreness, stiffness, ACL, PCL, MCL, and other knee pain. With our sleeve, you'll be able to tackle any activity life throws your way, while ensuring you're a step ahead in injury prevention! PLEASE TAKE A LOOK AT OUR SIZING CHART AND MEASURE YOUR CIRCUMFERENCE BASE ON OUR INSTRUCTIONS!